One must remember that ancient rock artists were essentially amateur artists and using the rugged, hard medium of a rock face as their ‘drawing board’ could not obviously produce over detailed representations of such an epochal eruption sight. With only meagre artistic ability their only recourse was to take that eruption sight and draw, etch it in a bare, minimalist artwork style using only a single line to record the eruption outline shape. Important to the artistic interpretation of that eruption scene was the effect of light and shadow cast by the blazing fireball within the two sequences of the eruption spectacle. So let us now take that combined eruption spectacle and schematise those visual elements with a single line to their barest graphic form. The initial explosion creates a dome-like Wilson cloud form. The fireball within casts a shadow line around the outer dome silhouette shape and is drawn as a dome-like arc shape by the ancient rock artist. The fireball then goes on to erupt up out of the top of the dome shaped Wilson cloud form, which dissipates from sight, and climbs up into the sky within a mushroom cloud canopy. Because the blazing fireball within the mushroom cloud is rising up, it continually diffuses with light the top of the mushroom cloud canopy but conversely throws the underside of the cloud canopy into contrasted shadow. The rock artist draws the shadowed underside of the mushroom cloud as an upturned curve shape. 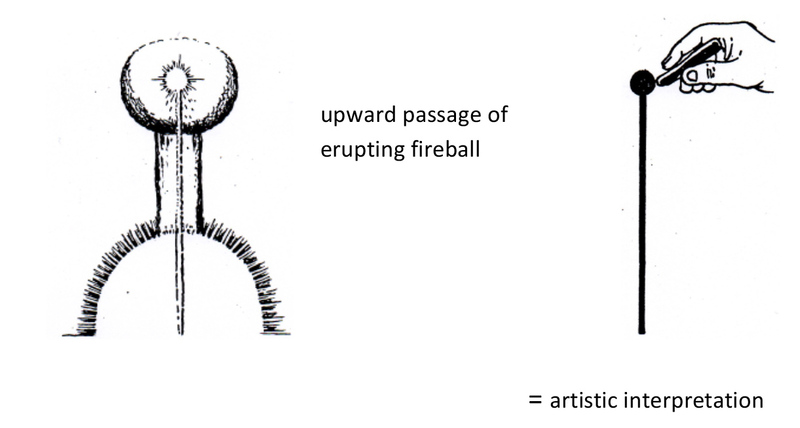 While the upward path of the eruption fireball within the two sequences of eruption would have been a dazzling sight the amateur ancient artist, working with only one dark colour, drew the path of the erupting fireball as one single dark vertical line which visually joined the two eruption sequences. Now when we merge these three single line imagery elements of the combined eruption sight together as one artwork we have the composite schematised form on the right. As the reader can see the single line schematization of the two stage eruption spectacle sequence to its barest graphic elements looks exactly like the upraised armed, bowlegged rock art form. I believe then by a quirk of cosmic coincidence, a huge eruption spectacle I believe from a near past impacting asteroid, when schematised to its bare imagery elements, happens to coincidently look like a human figure form, albeit an upraised armed, bow legged form. 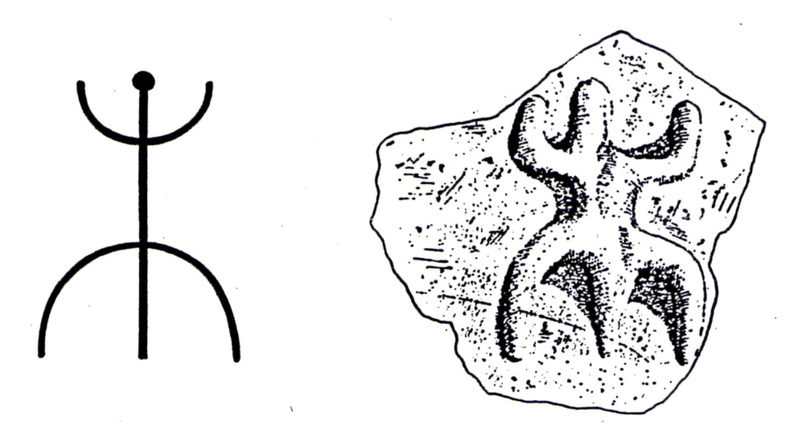 A figure form that as explained is found around the world recorded as rock art. If this is the case then it would explain why ancient rock artists consistently portrayed such an unusual and unnatural upraised armed and bowlegged stance. It would also explain the unusually overlong phallus depicted on such rock art. We could now realize it is not a phallus image at all but a single line representation of the upward path of the erupting fireball. That its human-like graphic form has effectively camouflaged a highly significant asteroid impact event from the comprehension of succeeding generations till this day because it has been mistakenly viewed as something so commonplace as to raise no suspicion to its actual real impact identity. As I have outlined its possible that the earth has suffered a series of quite large impacts from Taurid meteor storms over a very long period of time and that each time more or less the same schematised upraised armed, bow legged imagery has been interpreted from the impact eruption spectacle. That being the case the origins of this upraised armed , bow legged rock art image may stretch back thousands of years into the dim past while other rock art depictions of it are comparatively newer versions, depicted within a historical time frame after the most recent large impact event.